See how far I’ve come? Ha. If you’ve ever snowboarded, you know the first few times out there can be downright painful not to mention frustrating. At the end of the day it usually feels kind of like someone scrunched you up into a ball and threw you against the wall a few times because that’s how much your body hurts. It does however get better, the more you do it. Eventually you learn to get down the mountain without bruising your tailbone, spraining your ankle or catching your downhill edge and getting whiplash as your head hits the ground (thank God for helmets). One of the things that made me a better rider, believe it or not, was when I took telemark skiing lessons. (I mean I had to find one way to get down Mad River Glen). 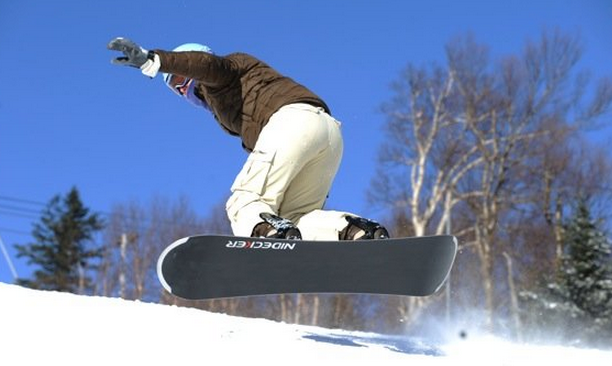 For some reason learning a different way to slide down the mountain gave me more confidence and skill on my snowboard. I’m not sure why exactly. I figured if it can work with snowboarding, it can work with fiddling. I am always trying to improve my fiddle chops and I think sometimes its good to pick up another instrument for a little while. If for nothing else but for realizing that yeah, you can play fiddle. Recently, I was asked to review an Irish Whistle Tutor. So I thought this would be a great opportunity to start learning another instrument – the Irish whistle. Luckily it is one that is still in line with the genre I play in not to mention, easy to transport. So just as I learned to get better on my snowboard through teleskiing, I am hoping to get better on my fiddle through whistling (sorry neighbors). I’ll keep you posted as to how it goes. And check back for my review of the Irish Whistle Tutor.